The Armenian alphabet reveals the atomic numbers of some metal elements. This work embarks on a preliminary logical and historical analysis of the numerical values of the alphabet and their predictions of the proton count of some metals within the periodic table. 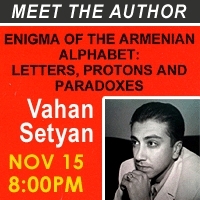 Considering the apparent precision of the associations, one may ask whether the Armenian alphabet – a group of symbols that resurfaced again after the complete destruction of Armenian literature by the onslaught of Christianity in the Western world- contains a larger realm of information than the eye may initially see. The attempt to answer this question is less trivial than one may think and more paradoxical than one may imagine.